The Roadrunners begin a six-game home stand tonight when they match-up against the Texas Stars, which will be the first time the teams have met since the second round of the 2018 Calder Cup Playoffs, a best-of-seven series which Tucson dropped in five games. 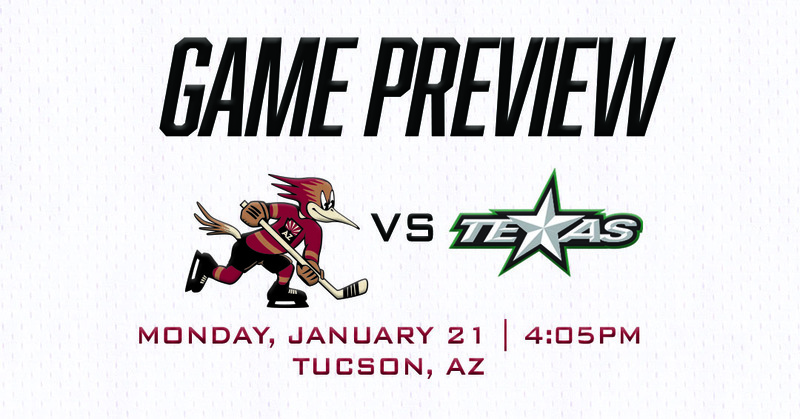 The Stars are in Tucson to complete a five-game road trip, and one that hasn’t been kind to them thus far. Texas has lost each of its first three games on its current tour, the latest a 4-2 defeat at the hands of the Stockton Heat on Saturday evening. Comfort zone. If the Roadrunners have had one this year, it’s been second-place in the Pacific Division, where they’ve been situated for all but five days this season. They were bumped from their familiar spot for a few hours leading into their 2-0 shutout victory over Colorado on Saturday, but that win, coupled with the San Diego Gulls’ 15-game point streak being snapped in a 6-2 loss to the Bakersfield Condors, saw the Roadrunners reclaim. Texas hasn’t been very good on the road this season, having earned only 15 of their 47 standings points in opposing buildings. The Stars are 6-10-2-1 as visitors and have dropped six consecutive games (0-5-1-0) away from their home confines. With February’s annual Gem Show road trip looming, as it always does, the importance of the Roadrunners’ coming stretch of home games sells itself. The team is an attractive 11-5-0-0 at Tucson Arena this year. BUNTING’S BURYING: Forward Michael Bunting has himself a weekend in Colorado, scoring three goals in the Roadrunners two games against the Eagles and now has 16 points (6G, 10A) in his previous 15 AHL contests. Despite missing a notable amount of time during his two NHL recalls with the Arizona Coyotes, Bunting enters the evening third on the team in points with 22 (9G, 13A). EARLY IMPORTANCE: The Texas Stars are a dangerous team when netting the game’s opening goal. They have registered the first goal in 21 of their 40 games play thus far, and when doing so, are 16-3-2-0, earning points in 18 of those instances. The Roadrunners aren’t bad themselves when finding the net first, going 13-4-3-0 when doing so. SWEET SIXTEEN: Four players enter the evening with 16 points registered on the year: forwards Giovanni Fiore (8G, 8A), David Ullstrom (7G, 9A), Tyler Steenbergen (6G, 10A), and Brayden Burke (6G, 10A). Steenbergen and Burke, with their aforementioned point totals, are tied for the team lead in scoring among rookies. EIGHT-ONE-EIGHT: The Roadrunners are 9-2-0-0 on home ice this season when scoring a power play goal, translating into a .818 win percentage. They have converted on 20.5% (16-for78) of their power plays at Tucson Arena this season. Texas has successfully killed off 82.5% of its penalties on the road this year, which ranks 13th in the AHL. 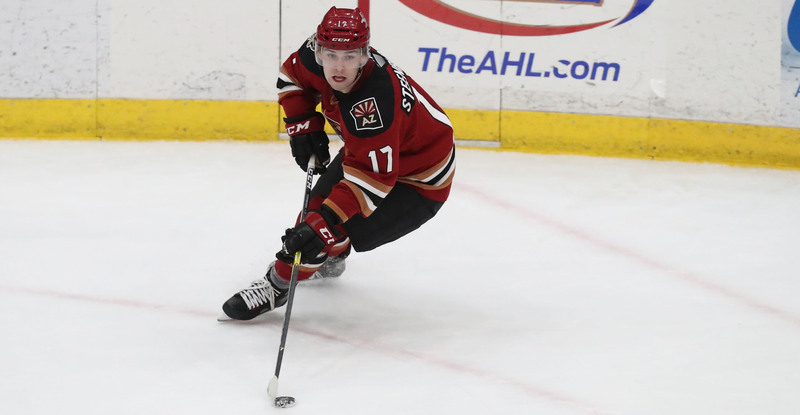 Catch tonight’s action LIVE on AHLTV or join Roadrunners play-by-play broadcaster Adrian Denny on AM 1450 Fox Sports Tucson as he calls the game from the Roadrunners’ flagship radio station, where coverage begins at 3:50 PM.